Water skills For Life skills are categorised into seven broad areas. For each skill category download the teacher resource, student achievement certificate and classroom poster. 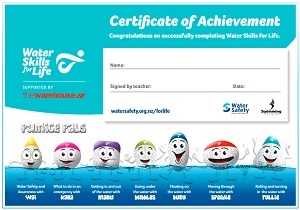 Certificates have been designed for students to colour them, a further way students can keep engaged with Water Skills For Life and to reduce printing costs for the school. Print this Assessment sheet to check whether students are competent in Water Skills For Life. Certificates require the teacher to enter the achieved skill(s). Student assessments must be entered into the Water Skills For Life database. Click on the link below to access the database. You will require a login and password. If you're new to the database, contact Michelle Reidy at Water Safety New Zealand, on wsnz@watersafety.org.nz or phone 04 801 9600. Original generation time 1.2114 seconds. Cache Loaded in: 0.0263 seconds.